5lb Bag. 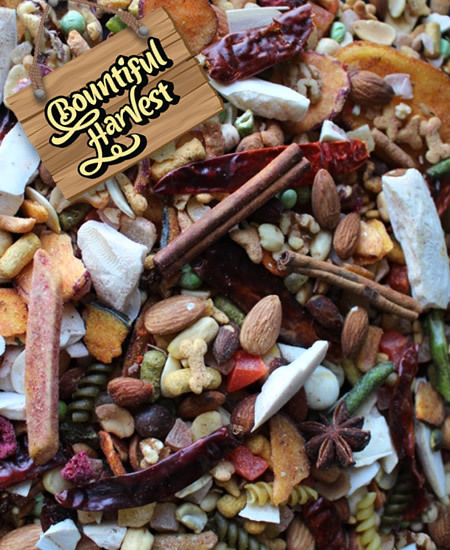 An awesome MySafeBirdStore custom blend consisting of human grade dried vegetables, nuts, fruits, herbs and natural pellets - PLUS added cuttlebone, shelled almonds, chili peppers and cinnamon sticks - all very pleasing to your bird's taste buds and HEALTHY! This blend is not loaded with a ton of sugar-coated and sulfured "filler" and contains over 75 different ingredients. Ingredients: Natural pellets, together with roasted Cashews, Cranberries, Natural Papaya, Roasted Almonds, Natural Pineapple, Large Pumpkin Seed, Banana Chips, Mangos, Golden & Red Grapes, Pepitas (Shelled Pumpkin Seed), Carrots, Apples, Filberts, assorted Cooked and Dehydrated Beans and Peas, Cuttlebone Chunks, Sweet Peppers, Roasted in Shell Pistachios, Blueberries, Pine Nuts, Whole Turkish Dates and Figs, Sweet Potatoes, Green Cabbage, Freeze Dried Peas, Roasted Chic Peas, Cherries, Shelled Walnuts, Shelled Filberts, Shelled Pecans, Freeze Dried Strawberries and Mangos, Goji Berries, Parsley, Peaches, Freeze-dried spinach, freeze-dried Garden Peas, Parsley, freeze dried Chives , Red & Green Sweet Peppers, freeze-dried corn, freeze dried peas, freeze dried honey, freeze-dried celery, dehydrated green beans, chamomile flowers, cilantro, dehydrated Green Cabbage, dehydrated basil,Whole (white) Pumpkin Seed, Roasted Cashews, Roasted Almonds, Banana Chips, Shelled (non-roasted) Brazil Nuts, Flaked Natural Coconut, Roasted Corn, Roasted Soybeans, Pepitas (shelled pumpkin seeds), Granola made with: Rolled Wheat, Canola Oil, Natural Coconut, Sweet Dairy Whey, Oat Flour, Roasted Almonds and Honey, Natural Mango, Shelled non-roasted Filberts, Cooked dehydrated Beans & Peas, Grapes, Cherries, Whole Sweet Corn, Whole Cinnamon, Roasted Chic Peas, Sweet Red and Green Peppers, Organic Wheat, Organic Whole Oats, Carrots, Tomatoes, Apricots, Natural Cinnamon Flavored Crispy Apples, Peaches, dried Lactobacillus acidophilus fermentation product, dried Lactobacillus casei fermentation product, dried Lactobacillus plantarum fermentation product, dried Lactobacillus fermentum fermentation product, dried Enterococcus faecium fermentation product, and dried Bifidobacterium longum fermentation product. 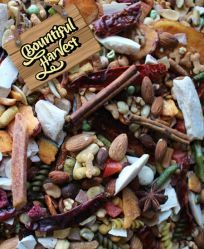 Notify me when Bountiful Harvest PLUS Blend for Parrots 5 lb Bag is in stock.